Visits: 24302 persons viewed this recipe. Come mango season and women in many households in India get ready to make enough mango pickle to last for the next few months. It is equally popular in the north or the south, east or west and enjoyed by everyone whether young or old. Spike your Food with mango pickle eat it with the rice, its sour and hot taste titillates the taste buds. The mouth watering pickle is made from raw mangoes, mixed with chili and turmeric powder, oil, garlic and a concoction of seeds like mustard and fenugreek. Raw mango is cut into small pieces, mixed with spices and seeds and stored in jars. Within a week the mixture of spices and mango pieces turns into the mouth watering concoction. Combined with every day food, mango pickle adds a zing to the ordinary food. Wash the mangos and dry it well. Chop it into small pieces along with the skin. Transfer the chopped mango into a bowl. Add 1¼ table spoon of salt and toss them well. Slice the garlic and keep aside. Heat a pan and put pepper corns, mustard and fenugreek seeds. Remove from the flame when all of it (mustard and fenugreek seeds) has spluttered. Crush it and sprinkle it over the mango pieces. Make a paste of chilli and turmeric powders by adding ½ cup of water. Heat 4 table spoons of coconut oil in a pan. Put sliced garlic and sauté well till it turns golden brown. Now, add the chilli and turmeric powder paste. Boil it for 2-3 minutes and turn off the heat. Proceed to add 1 tea spoon of asafoetida powder and mix it well. Allow this mixture to cool completely. Once it has cooled, add this to the mango pieces and combine well so that all the pieces are coated well. 1) Salt seems a lot in the first day and it will be balanced by the sour juices of mangoes in the coming days. So it is better to start serving mango pickle after 1-2 day’s time. 2) Always use dry spoons to scoop the pickle. Never use a wet spoon or a jar which will leads fungal growth in the container. 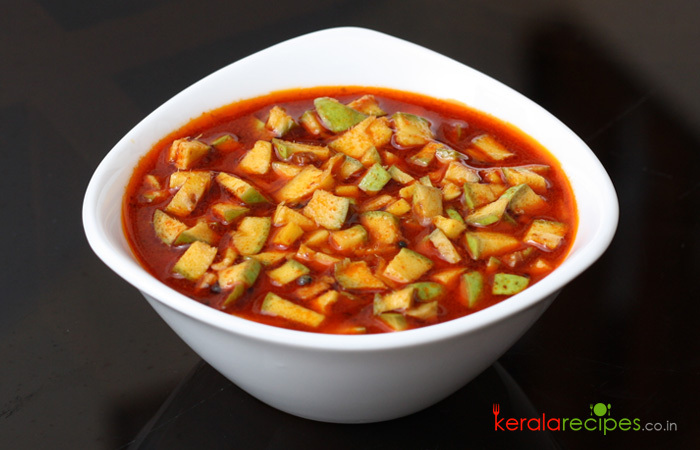 3) You can keep the mango pickle in room temperature for few days. But refrigerate it to last long. Dear Shaan, You can also make of green Papaya (Koppakkaaya) same procedure only add is Vinegar to it. Bobby, Thank you very much for the tip. Easy and simple and tasty recipes. Thanks.